The RGNUL Patiala administration has agreed to protesting students’ four main demands in writing, putting to an end five days of student protests kicked off by the suspension of six students. The peace agreement was witnessed (and partially brokered by) Punjab’s advocate general Atul Nanda, who met with students and the administration on campus today. Five students signed on behalf of the student body. 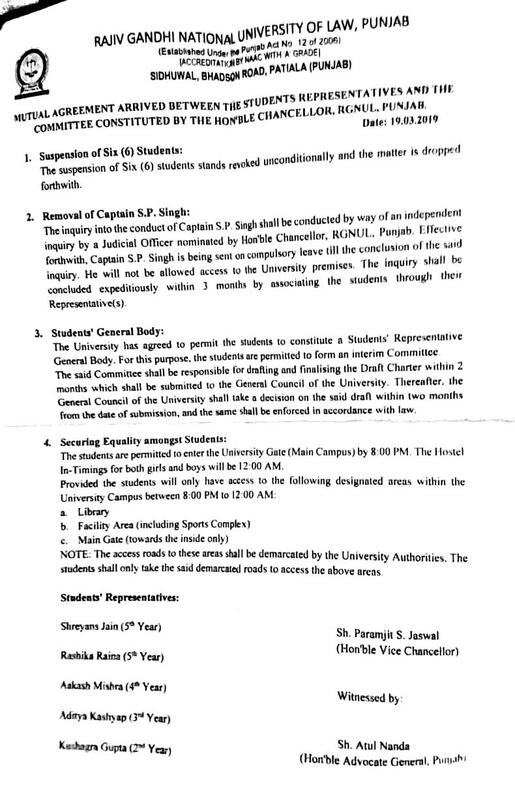 Update 20 March, 00:11: The same five signatory students in a separate letter of undertaking from the one pictured above, co-signed that “it is agreed that the complaints made to various Authorities shall be withdrawn forthwith and we repose our faith in Hon’ble Vice Chancellor RGNUL Punjab”. Those complaints included one made by the students to the National Commission for Women (NCW) on 18 March. The five signatory students also “authorised the [complainant] to withdraw these complaints”, according to the letter. As we had reported yesterday, students had requested that accession to their demands be recorded in writing by vice-chancellor (VC) Prof Paramjit Jaswal, which has now been done. We have reached out to Jaswal for comment. First, Jaswal agreed in the letter that the suspension of six students was “revoked unconditionally”. Students argued that those students had been singled out unfairly for their protests, when nearly 200 students had also protested similarly against low-quality mess food by banging metal trays on tables. Second, a key demand of students had been that campus administrative officer Captain SP Singh should be removed. While Jaswal had reasonably argued yesterday that promising removal was outside his powers, he has now assured the students that an “independent inquiry” by a judge nominated by Jaswal would inquire into Singh’s conduct. The inquiry would be held by “associating the students through their representatives”, allaying student fears that the inquiry could end up being biased or unfair. In the meantime, Singh would be sent on compulsory leave. Third, Jaswal agreed in writing that students would be allowed to form an interim student committee (seeing as the state of Punjab doesn’t allow student body elections yet). The university’s general council would take a decision on its draft constitution within two months of submission. The final bone of contention was the - in practice - discriminatory hostel timings for male and female students. Though on paper, a 9pm curfew existed for both, male students would in reality be allowed to stay out until 1am, whereas women allegedly encountered difficulties, chastisement and calls to parents for missing the 9pm deadline. In the letter, Jaswal agreed that students would be permitted to enter the university’s main gates until 8pm, with an extended on-campus hostel curfew of midnight, provided students only used those four hours to spend time in the library, facility area and near the main gate. The agreement was witnessed by five RGNUL students from second to fifth year. As far as student protests go, this was a long one but ultimately one of the most successful. Particularly the institution of a student representative body, will hopefully go a long way towards resolving student grievances without protests in future - as Jaswal had also agreed it would when we talked to him yesterday. The ineffective NUJS SJA should learn a lesson from this instead of showing off non-existent pyrrhic victories. Kudos to the RGNUL students for having shown such resolve! You cannot achieve much unless you stand ready to take to the streets. If the girls in RGNLU are allowed to vote through a secret ballot on the issue of hostel timings, 80% of them would agree to "upto 9.00 pm" as they are not interested in hanging around outside hostel after 9.00 p.m. So, do not blame girls. Dare to go for secret ballot on the point and see the results. After the results, nobody would ever blame the girls in other NLUs too. Dont think you ever studied in an NLU. Or if you did, I feel bad for the NLU you went to. Back at the time I was at NLIU Bhopal every girl wanted the campus to be accessible to them all night. Extending the curfew timing doesn't mean girls would not be allowed to get back to the hostel before 9 p.m. if they want to. Given the state of your logic, one shudders to think of the state of your legal training. It has nothing to do with legal training. The hostel curfew (sic curfew?) is not an issue for a overwhelming majority of the girls. The girls know outside realities when the parents make frequent mobile calls as and when their daughters get late reaching home after the sunset. That is why, it can be confirmed through a secret ballot. And why their parents should not have any say on the question of hostel timings. Being in girls hostel does not mean that the parents-wards relationships get terminated. Dude, I'm amazed to see you still at this. Get this into your head, if 90% girls want to stay in after 9 p.m. and 10% want to stay out till 12 midnight, even then the timing should be 12 midnight only! That is satisfactory to 100% people. Please get some training in logic. But there is difference between "upto 9 p.m." and "after 9 p.m." I am talking about till 9 pm and you are talking about beyond 9 pm. We are not on the same wavelength. Till the males learn to respect females, discriminatory timings must prevail to protect the females. If males can't respect females, get the males to stay in after 9 p.m. within the hostel, not the females. You seem increasingly like an RGNUL faculty or admin guy. It's a miracle your students still emerge as decent human beings and lawyers after having been exposed to the thoughts of the likes of you for five whole years! @Joyful - You definitely are from RGNUL. A comment posted 5 weeks ago was not published. I guess you do bring joy to people's lives by leaving the scene, can't fathom any other reason of your name. Being an alumnus of RGNUL, I sense that you could be a member of the regressive faculty/ admin, since your lack of understanding and ignorance perhaps only matches the horniness of Bill Clinton (and trust me, while I have encountered dimwits in my life, nothing ever came close to the Rgnul admin). Here's the deal, you have to stop imposing your understanding of morality, of what is right and wrong, on others' lives. The girls' choices are theirs to make- whether to stay out after 9 or be at the hostel, should completely be upto them. One of the reasons why the protests were made was that while boys had such freedom of making this choice, the girls didn't. Such blatant discrimination has no place in a modern society, let alone a law school. Normally, I would refrain from engaging with the likes of you, cause you don't need treatise but treatment, but here's giving it a shot. Just ask for a secret ballot on hostel timings for girls. The girls would give a befitting reply. 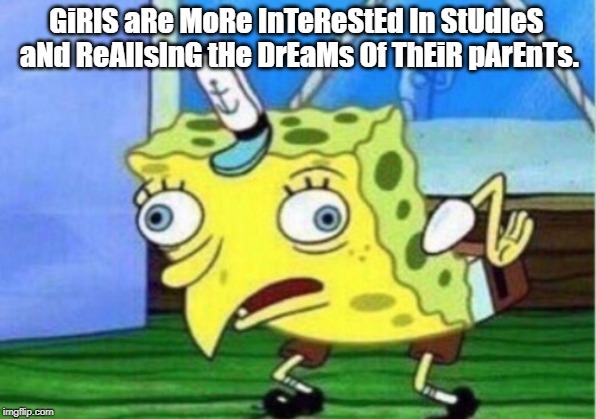 Girls are interested more in studies and realising the dreams of their parents. They indulge only in a disciplined fun and frolic. A great majority of them just do not hang around outside the hostel after 9.00 p.m. If you are from any NLU, you would agree with me. Interviewer: So what was your biggest achievement during law school? Depending on the role, and the demands (which seem reasonable here), I'd be tempted to hire: managed to gain concessions against overwhelming odds without resorting to violence. If that's not leadership and advocacy, what is? I think the management probably has much to learn about leadership from these students. I do not think the poster had the opportunity of either working in or cracking an interview in a law firm or in any corporate setting. From someone who worked in corporate houses / law firms both in India and abroad, most interviewers will see that as tremendous leadership and sign of good character. Contrary to 'public belief', employees do not want sheep, they want leaders and free thinkers who can function independently and get job done. If you want real reform a joint NLU protest across 20 NLUS is a must. In 6 months, some other NLU will protest, the NLU consortium will again tweet some stupid statement showing solidarity, the protest will end in 2-3 days, and things will again fizzle out. Dude, please go get some. Your blue balls are hampering your clarity of thought. Just because people are smooshing booties, doesn't mean they are not interested in studying. 5.1 was supposed to be 6.1. LOL. Why do the students want be out so late? We know the reason. The demand should have been rejected. It will lead to indiscipline. They want to stay out in night on one pretext or other. If they are asked to return to campus before 9 pm, they would demand library to remain open till 2 a.m. in night. Go and see how they utilize the library resources in late night. Only 10% come to library to "study" late in night. 90% have some other purposes to remain out of their hostels in late night. Why are they so touchy about "night" timings only. I want to make out with my girl friend, since that is what you are insinuating. Now tell me what is the problem? @Berozgar: Because they are not getting any. Isn't that kind of obvious? No problem. But, then be honest in adding this in the charter of demands. Suddenly the food becomes of a bad quality. The VC becomes a dictator. Instead of demanding an increase in the library timing late night, write frankly in the charter of demands you want to hang out with your girl friend during late night. You want to store alcoholic substances in your hostel rooms. Be honest in writing all this in charter of demands. I do not believe that the right to demand reasonable freedom of movement has to be accompanied with an iron-tight itinerary of where exactly I plan to move. Of course, if the authorities find that students are abusing the right in any manner, they are completely within their rights to impose penalties on those students, but to curb such freedom in the name of preventing any abuse is completely arbitrary under any law whatsoever. SP Singh, is that you? It's not the truth. The students wanted to protest because this is unfair and discriminatory. So [...] if you are so narrow minded so as to not perceive the inherent wrong in the practices against which the protests were happening. I hope this will not affect Prof Jaswal's chances of becoming NLUD VC. People should realise that is was a protest against the AO and not the VC. He is a top scholar and administrator who promptly met the students and took action. He spoke in a nice manner to the students and the students thanked him. If you see the protest video, the students even said sorry to him. Prof Jaswal is a really good person and will be a great VC for NLUD or any other NLU. If NLUD students or alumni are reading this, mark my words. Do not make the same mistake that NUJS did by letting the likes of Ishwara Bhat in. If this guy becomes your VC, then all the meteoric rise your institution has seen under your current VC will soon become a thing of the past. Ignore this advice at your own peril. Prof Jaiswal for NLU D? I don’t think that’s happening ever. NLUD is not RGNUL. Most of the VC appointments are political these days. Stranger things have happened. Who could have been foreseen Ishwar Bhat at NUJS after the likes of Menon, Chimni and M.P. Singh? Better be safe than sorry. No, there are no political appointments in the NLUs. The appointment of Vice Chancellor in an NLU is "fixed" by a caucus of Professors-turned-Vice Chancellors having its epicentre in Delhi. That is why you see one VC hopping from one NLU to another NLU or getting the second term at his place easily. That caucus itself has political connection. Otherwise how do you think BimPa got the position at GNLU? Or how the state is controlling the search committee at NUJS? That's why you need someone like Ranbir Singh to have political clout or connections to land up at NLUD, regardless of how good you are as a candidate. Ranbir Singh did good work at NALSAR that's why he got NLU- Delhi. Political connections had nothing to do in it. PS Jaswal has done good job at Raipur and Patiala, he may get NLU- Delhi. Nothing political about it... Or political connections. Keep saying that to yourself thrice a day and you may even end up believing it yourself. Incidentally, what 'good job' has been done at HNLU and RGNUL, pray tell? See what the outside worlds saying about RGNUL. Shame. It's an exaggeration but not too far from the truth. The students are more or less as good as any other NLU out there, but the faculty sure are subpar. The drug problem really is getting worse, though. Weed is one thing but some of the harder stuff is making inroads and fast. Nobody smokes weed in Rgnul. It's a hash heaven. RNGUL is in Punjab, which has big drugs problem. It was a display of hooliganism and disrespect by the students. They targeted one person who is an ex army officer and another person who has been given honorary colonel rank. Shows the mentality. There you go. Now there will be references to Siachen soon and all the students will be termed anti-national and told to migrate to the Punjab in Pakistan. A joint NLU protest must happen demanding INI status. The best time for it is July-August 2019. A fresh cabinet will be in charge and a little more enthusiastic early in its term. Meanwhile, Gogoi will be 2 months way from resigning and a new CJI with a 6-year term (Bobde) will be sworn in October. He will be aware from day 1 about the problem. He is also currently Chancellor of MNLU Mumbai and will remain so on becoming CJI. INI status will not solve everything but it will be a start. More funds for infrastructure will help student + salary conditions at par with IIT/IIM will attract better faculty. Bobde has a two year stretch as CJI. Jaswal was a frontrunner for NLUD until this protest. He is close to Ranbir and had his backing. He is still a frontrunner. Protests haven't diminished his chance to be VC of NLU- Delhi. 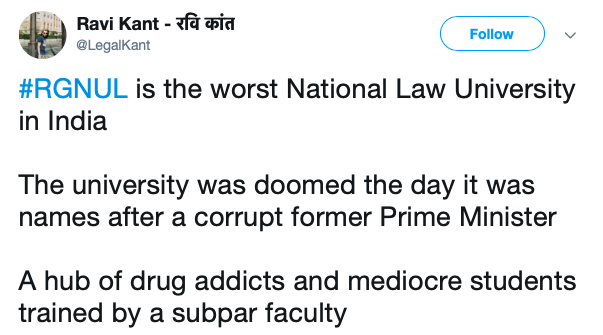 I don't think Prof. Jaiswal stands a chance now for NLU-D, unless you really want it go the RGNUL way! GNLU is not behind, and it'll start the protest. GNLU will never protest. The most cowardly student body ever. If NLSIU appoints an alum as VC and discards the 10 year prof rule, it will set a trend for other NLUs to follow. NLUD will be next. NLSIU need not discard the ten year rule to appoint an alum as VC. Sudhir et al qualify as it is. NLSIU is the reason why a joint NLU protest is not happening. It will only materialise if they take the lead. Why should NLSIU protest exactly? They are on the verge of getting an alumnus for a VC, which might eventually lead to them regaining the obvious advantage they used to have over every other NLU once. If they didn't protest during Venkatarao's term, doing so now would be foolish of them. They are also not plagued by debilitating infra issues like many other NLUs and have the strongest alumni network that take care of a lot of problems. Kian, there is a news blackout of the GNLU registrar's sacking after the TOI report. Please try and get some news. This is sensitive because elections are coming and we know who will benefit if Modi returns. Kian, Bar and Bench has published a very disturbing complaint by RGNLU students. Do you have access to the original complaint, which B&B has not published?